In the June 2013 edition of the Rogue Valley Labor Trends publication (see PDF pg 5), Employment Department’s regional economist, Guy Tauer, puts together an important and interesting look at Oregon’s counties. What Guy does is examine demographic and economic data for all counties and compiles a ranking based on these changes over the past decade. The counties rank from 1 (the best) to 36 (the worst). While our office may have some suggestions for augmenting the specifics – more or that later – we believe the work Guy has done is important and hits on a number of themes we have been researching and trying to highlight as well. A recent article in the Huffington Post, Census: Record 1 In 3 Counties Dying Off, Hit By Aging Population, Weakened Local Economies (March 14, 2013), offers a sobering summation in that descriptive title regarding much of rural and rust-belt America. These troubled counties are struggling due to aging population and weakened local economies that are causing young adults to relocate to other areas. The article cites Census data that shows 1,135 of the nation’s 3,143 counties are experiencing natural decrease, meaning deaths are exceeding births. That number rose from 880 counties in 2009. Guy goes on to discuss each of these factors in terms of why they are important and then also the pros and cons of each. For example, in the short run strong gains in jobs or population does create some possible negative side effects such as rising housing costs or congested roads, which over time should be alleviated however not always. I highly suggest reading the full article over on the Employment Department’s site. Guy was kind enough to share with me the underlying data and I put together the map below. Overall there are not too many surprises here. The stronger gains (or few losses, when looking at employment) were seen in the metropolitan areas of the state, the I-5 corridor and along the Columbia River. The weaker gains were seen along the coast, and in the southern and eastern counties. These patterns apply for each of the four indicators included in the ranking. Our office has tried to discuss and highlight the diverging employment trends across the regions of the state, particularly during the recession and so far into this recovery (see HERE, HERE and HERE for some examples) and also the demographic outlook (see HERE and also the slides and discussion from the lastest revenue release). Again, we believe this type of analysis is beneficial both in terms of examining past performance and also gauging some potential risks and returns moving forward. This type of work has been on our mind lately, particularly after a discussion with one of our counterparts in New Mexico who tried to examine what he called “at-risk” communities there. He looked at business taxes by location and tried to find smaller population areas that were dominated by just a few businesses or employers, which indicated at least the potential for possible downside scenarios should those businesses leave or go under. Guy’s work highlighted above is very much in this same vein and important to consider. The distance to an interstate or major (air)port and the transportation and warehousing employment would be used to to try and get at access to markets and overall infrastructure. Natural resources employment has been a good predictor of economic changes over the past two decades in Oregon and likely will be in the coming years as well, for either good or bad. 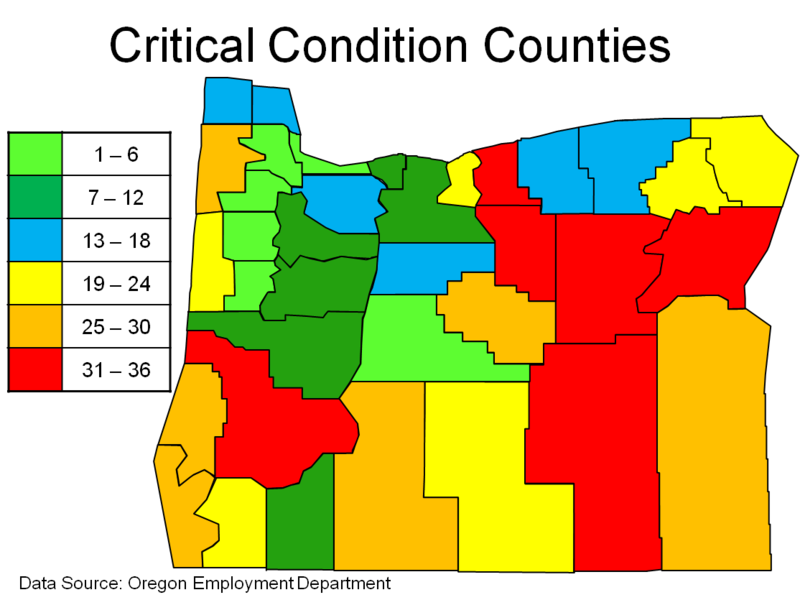 Furthermore, when examining the recession across Oregon and Washington counties, the one location quotient that had the highest correlation with employment losses was wood products manufacturing. Finally, if a local economy is weighted toward the major growth industries in the state and US then that likely bodes well for local growth. Conversely, those local economies dominated by the lagging sectors will likely see slower growth.